I Smelled This As Soon As I walk Into My Brother’s House. LOVE in a Bowl. Having A Ladle Of This Made Me Feel Loved and Cared For. I had been in Northern California for over a month with our three youngest kids. Our son was given an intern at the small airport where his Civil Air Patrol met and it just worked out for me to pack up the kids and go for the whole summer. At the end of summer we returned from the small cabin we had rented in the Sierra Mountains back to Southern California. Ii was over eight hours of driving in our very crowded Camry. To simply state that we were tired would be like saying the Olsen Twins are thin. After we got over the Grapevine we were going to stop at my brother’s home. He was expecting us. I was looking forward to seeing him and I think all four of us were anxious to get out of the car. But, I totally did not expect to be wrapped in the aroma of what he had simmering on the stove when I walked in the door. I felt so loved and comforted from my head to my flip-flip wearing toes. “What is that?” I asked hi after a hug. This is what Katerina of Diethood has to say about this amazing recipe. Even though this recipe is ridiculously easy, and each one of you probably has their own version of it, it’s all the random flavors that totally make it. 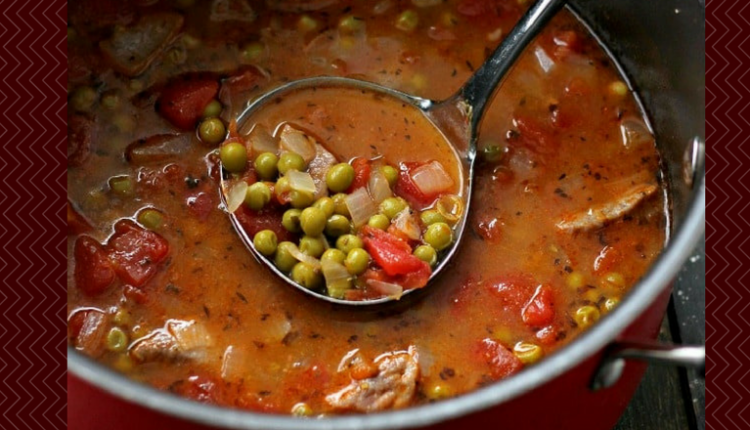 Beef, peas, tomatoes, onions… the combination is SO GOOD! Quick Tip: I actually cook several strips of bacon in the ditch oven until crisp. Remove to paper towel and use drippings to braise the meat in. Right before serving I crumble the bacon and add to top. I Admit, I love Samoa Cookies Just a Smidge More Than Thin Mints. I Wouldn’t Last Long In The Amish Community! I Love Plugging This In And Forgetting About It! Whatever I’m cooking if the recipe calls for thyme sprigs, bay leaf, or any other whole spice I leave them in the leftovers to added flavoring till it’s gone..